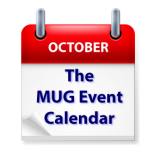 This week’s MUG Event Calendar is full of great events from top to bottom. Much the action will be in California, where Adam Engst of TidBITS and Take Control will address one group, while Chuck Joiner of MacVoices will speak to another, and Christian Pickman of Micromat will visit a third. Elsewhere, the topic of VPNs will be examined at a Florida group and Apple’s Photos app will be the topic for a New Jersey group. Also on the list are search tips, results of a photo contest, iOS 10, free Office software, Apple Watch and more. Silicon Valley Macintosh Users Group – Chuck Joiner of MacVoices on "What Apple Does Right"
Macintosh Meeting and Drinking Society – Roundtable Discussion: Using a VPN to secure your connection.